For the Native high school students, the hope is by getting a taste of the university experience they will be inspired and motivated to attend a higher education program after graduating high school. 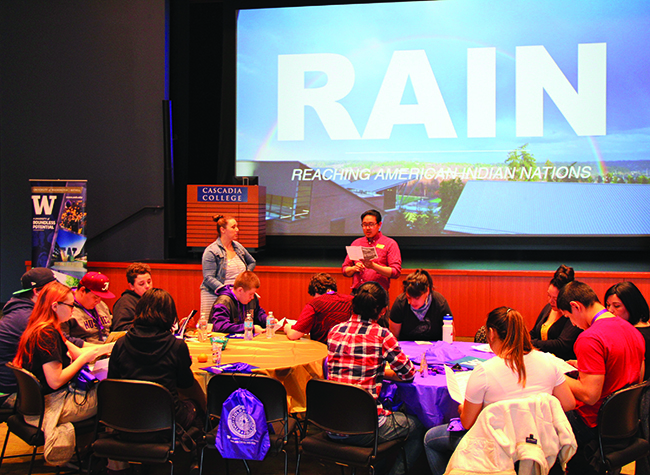 The University of Washington Bothell campus held its 5th annual Reaching American Indian Nations (RAIN) diversity recruitment event Friday, April 21. RAIN is a day dedicated to preparing students of American Indian, Alaskan Native and Native American backgrounds with the tools necessary to access higher education. Tribal high school students and faculty from Native American educational programs from all across Washington State were invited to attend RAIN 2017. Creating culturally relevant events where advocates, faculty, and college alumni can speak on all the reasons why potential high school graduates should attend college helps turns dreams into reality. Explaining why higher education is important as a Native American person, how the education can be used to connect to and better the community is all integral to changing the narrative. It doesn’t matter if it’s a community or technical college, online or big-time university, so long as Native students start thinking about and planning for life after high school. Interestingly enough, the inspiration that led to UW Bothell creating RAIN five years ago happened right here on the Tulalip Reservation. It was during a routine admission workshop that Rachael Meares, former UW Native American Outreach Coordinator, was undertaking at Tulalip Heritage High School that inspiration struck. The junior and senior high school students at Tulalip Heritage were so eager to participate in her workshop and to learn of the opportunities available at UW Bothell that Meares thought it would be really beneficial for the students to spend a day at the UW Bothell campus. While on campus, students participated in various workshops, while exploring and learning about what university life at UW Bothell has to offer them. The Tulalip students received an alternative college perspective that wouldn’t otherwise be available to them here on the reservation. A few months later, the entire Tulalip Heritage High School student body, with chaperoning from teachers, spent a day at the UW Bothell campus learning about the university and opportunities available only a short thirty minute drive south on I-5. That day marked the first culturally relevant outreach event for Native American students, which was given the name Reaching American Indian Nations, or more commonly referred to as RAIN. The next year Meares and her colleagues from the UW Bothell Division of Enrollment Management extended invites to Tulalip Heritage and other tribal schools across Washington. Matt Remle, Marysville School District Native American Liaison. At this year’s RAIN, the students were welcomed with breakfast, introductions of the coordinating event staff, and an opening prayer by Matt Remle (Lakota), Native American Liaison for Marysville School District. The students then heard a culturally oriented key-note speech from Abigail Echohawk (Pawnee/Athabascan). Following their warm welcoming, the high school students chose two available on-site workshops to attend. Keeping the idea of cultural relevancy in play, each workshop was specifically tailored to the Native American students pursuing higher education. 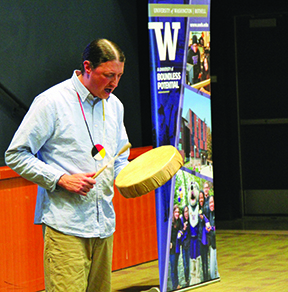 Each workshop was also led by a Native American staff member of UW Bothell. For the participating students, they received a glimpse of the university life that pushes the boundaries for what opportunities are available to them after graduating high school. They were able to learn about higher education opportunities and campus programs, while participating in cultural and educational workshops. The college admissions process, touring UW Bothell, and networking with community partners were designed to give students a better understanding of college life, while relating the importance of education to the individual and their communities. This entry was posted in Education, News, Tulalip News and tagged education, Native American students, rain, Reaching American Indian Nations, students, UW Bothell by Kim Kalliber. Bookmark the permalink.